A very important public meeting is scheduled for tomorrow – February 9th from 6:30 – 8:30 p.m. to allow residents to discuss the pediatric cancer cluster in the Acreage. Details from the original story is here. The location of the public meeting is Seminole Ridge High School – 4601 Seminole Pratt Whitney Road – Loxahatchee. Florida Governor Charlie Crist has weighed in stating that he will appeal to the federal government for their assisting into the investigation. This comes one day after Florida health officials said that there were no plans to search for the environmental cause of the cancer cluster. State officials additional plan to contact the National Institutes of Health. Meanwhile, Crist said that they state was now working with the U.S. Environmental Protection Agency and the U.S. Department of Health and Human Services. The good news is Florida Department of Health’s Chief of Staff Robert Siedlecki Jr. said that state officials will test the water and soil at cancer-stricken children’s homes. Anyone with additional information regarding the investigation, please provide any details in the comments below. Also, if you plan on attending the February 9th meeting (or if you attended after in concludes), I would welcome the comments. 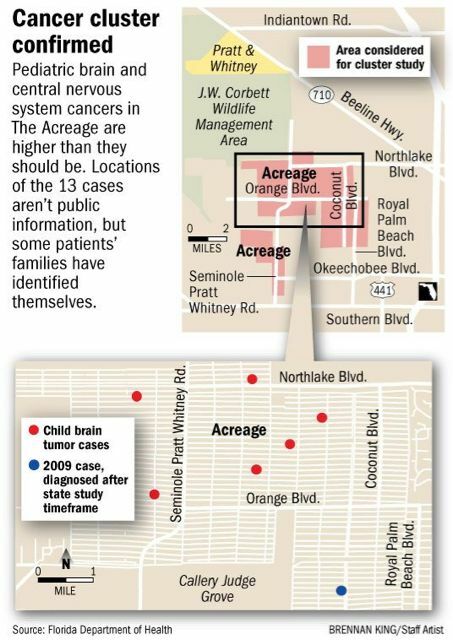 The Florida Department of Health confirmed that The Acreage in Palm Beach County is encountering a higher than normal number of brain and central nervous system tumors and cancer in children, especially girls. U.S. Senator Bill Nelson (D-FL) and other state lawmakers are calling for a probe to determine the cause. One environmental expert said that the cancer cluster did warrant national attention. Health officials state that they may never be able to determine the cause. Dr. Alina Alonso, director of the Palm Beach County Health Department, said that there are currently no plans to conduct environmental tests. “We need to give them the resources to make sure they can identify a cause,” said State Representative Joseph Abruzzo (D-Wellington). Environmental tests will not occur until the department finishes analyzing the interviews over the next two months. Authorities have identified 13 cases of brain cancer or tumors among children and teenagers in the community from 1993 and 2008. There was a significant jump in the number of cases after 2002 said Tammie Johnson, a state epidemiologist. There is enough data available thus far to label these cancer cases a cluster. Two more children were diagnosed with brain tumors in late 2009 generating fears that the cancer cluster is continuing to grow. Homeowners should insist on federal assistance said Peter deFur, president of Environmental Stewardship Concepts in Richmond, Virginia. He added that the CDC should conduct a health assessment which would include reviewing residents’ medical records and performing blood and environmental analysis. The Acreage is a semirural community in northwest Palm Beach County. As the name would suggest, homes are built on at least a single acre lot. There are farms in the area and farm equipment is stored on those lots. Quick aside: I looked at the area a dozen years ago about a year before my divorce. I really have to say that I liked the rural feel of the community and loved the idea of hiring and working directly with the builder that would construct my home. I suspect it is this reason that I have been watching this story develop. My daughter was 6 years old when I looked at the community. The state Department of Environmental Protection, which is not part of the cluster investigation, isn’t planning to conduct any tests, spokeswoman Cristina Llorens said Tuesday. The agency randomly sampled 50 wells last year and declared that ground water quality in The Acreage was “generally good,” despite some elevated levels of radiation that could come from natural causes. Excessive radiation can cause brain cancer. deFur said that The Acreage may be experiencing a “cumulative risk situation” where stresses on top of stresses exceed what people’s systems can handle. The fact the health department found a greater disparity in girls than boys raises a question of whether a hormone-disrupting chemical could be involved, he said. The state health department expects to complete the second phase of the study by mid-March, 2010. They plan to conduct interviews with 12 of the 13 families and review the cancer rates using updated population data. Note: The thirteenth family could not be located as they have moved from the area. If a third phase occurs, it may include environmental tests which would take up to one year to complete. A fourth phase would be a large-scale federal or university-based project. As mentioned earlier, additional studies are not currently planned. “Everybody is exposed to a multitude of things,” said Becky Samarripa, whose 15-year-old daughter had a tumor removed in 2008. Still, so many of these children went to the same schools, play in the same soil and drink the same well water that tests in at least one of those areas should be warranted, she said. New York law firm, Weitz & Luxenberg, affiliated with environmental activist Erin Brockovich, has been conducting water analyses since late last year. Officials plan to discuss the investigation at a public meeting.